Architect at Vardastudio develops own private living space in beautiful rural surroundings on site previously used as agricultural land. 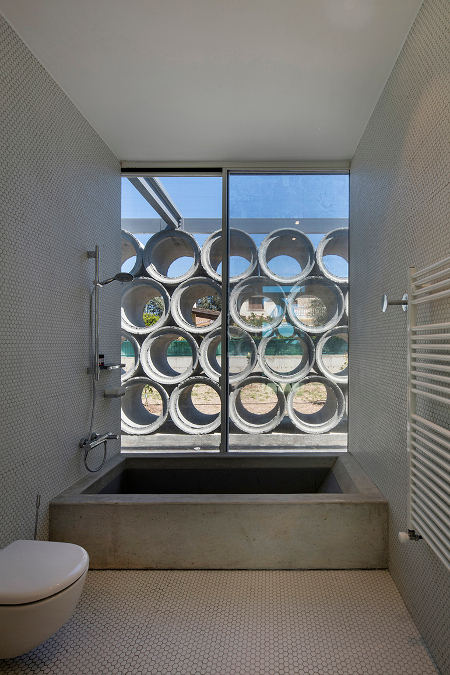 The project is the architects' own house. 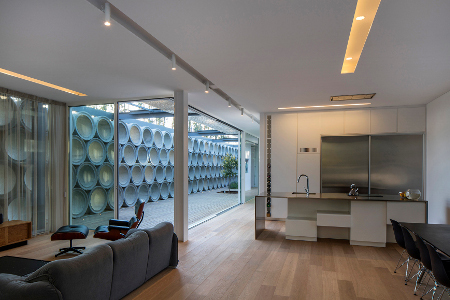 The brief was for a modern, energy efficient, single level residence, to provide a flexible living space for the architect coupe plus three children. Natural light and thermal comfort were priorities. We wanted the layout to integrate with the morphology and topography of the site. The site was once used as agricultural land meaning that it is surrounded by nature. 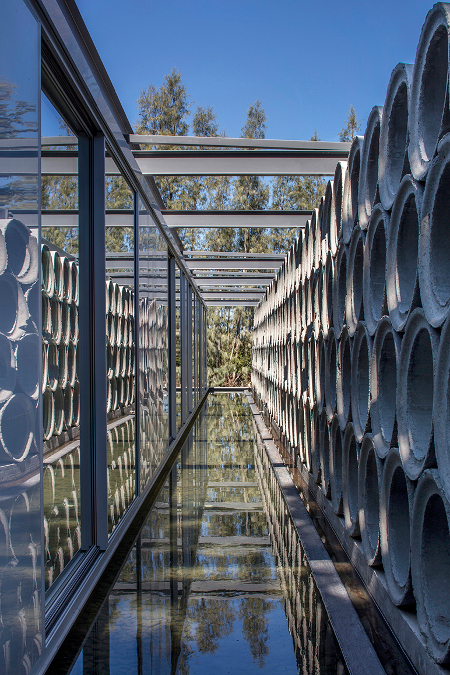 The tubes used in the area are also used to provide irrigation to the surrounding fields.The side of the concrete tubes inspired us to use them as a filtering device for an architectural synthesis. Our office has 21 years in designing and executing projects, and private houses are our specialty. The plan is the 4-bedroom house with open plan living - kitchen - dining area distilled down to its purest form, with a long gallery intended to display paintings. Our experience in procuring projects allowed the architect to appoint several sub-contractors and manage them efficiently. The layout is linear, generated along the east-west axis. A southfacing corridor connects the open plan living areas on the east extreme of the house to the master bedroom to the west. Three bedrooms and a study are accessible along the corridor. A pivoting bookshelf becomes the 4th wall and door to the study. A large deck develops to the south of the corridor. 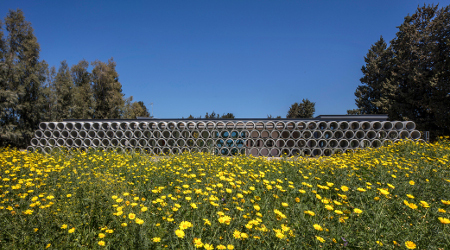 It is enclosed by the concrete tube wall, providing a private outdoor area, enriched by garden pockets planted with lavender. This was a pilot project for the Envelop3D system by Rabel aluminium company. 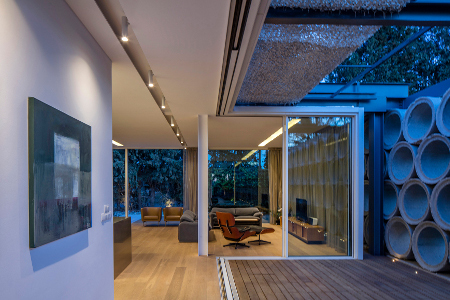 The manufacturer conceived the system, which integrates different aluminium modules (fixed windows, sliding, doors, external walls) in a universal aluminium channel. The project was the first implementation, meaning the elements were all being manufactured for the first time. As such there were some problems with timing, causing some delays. 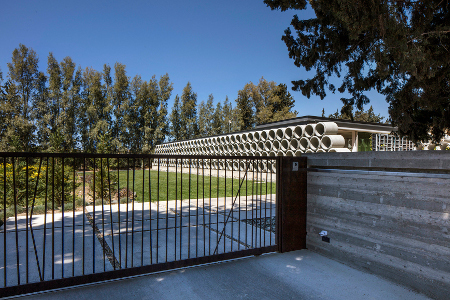 The concrete tubing in front of the southern and northern facades of the house is a sight that still impresses. The Envelope3D provides the entire skin of the building and integrates thermal and damp insulation behind a glass skin. Another would be the moving wall inside the house which acts as a system of creating an additional room or maintaining the gallery wall. The straight forward form and layout provided an ideal implementation for the Rabel Envelop3D system. 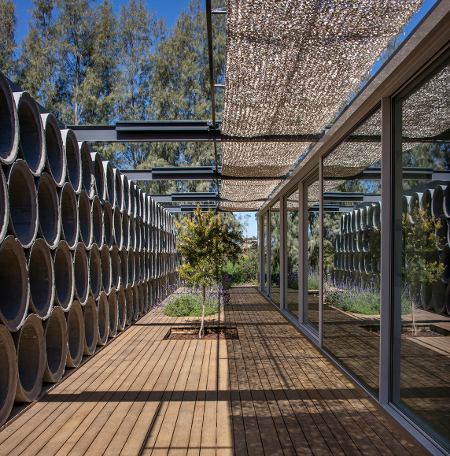 The combination of extended glazing with the re-purposed concrete tubes creates a striking image and an interesting spatial experience for the users, as it provides an additional degree of privacy and enclosure to the outdoor areas, whilst framing long views to the south from the inside.